Looking for an outfit with a little razzle-dazzle? Well, whether you need this costume for a decade’s party or if Halloween is right around the corner, we’ve got the perfect one for you. Cast an eyeball on this beauty. It’s our lustrous Women’s Dazzling Gold Flapper! Once you toss on this snazzy ensemble, wherever you’re partying, it’ll seem as if you own the place! This outfit will transform you into the glitziest gal in town. All the businessmen and lawyers you party with will think they’re in the presence of some sort of celebrity. Feel free to go with it! Are you going to say you’re a big movie star or an illustrious singer from the 50’s? The adventure will be yours to choose but either way, you will fit right in with the rich and famous. If you want to add a little more glam to this outfit then take a look through our accessories. Grab yourself a black boa to wrap around your shoulders and an exquisite cigarette holder to lazily swing to and fro while you strut around the party scene. Also, a little bit of jewelry never hurt any girl, so grab yourself a pair of gold earrings and a shiny beaded necklace. Once you’re all dolled up, you’ll be ready for a night on the town in these classy 50’s duds! 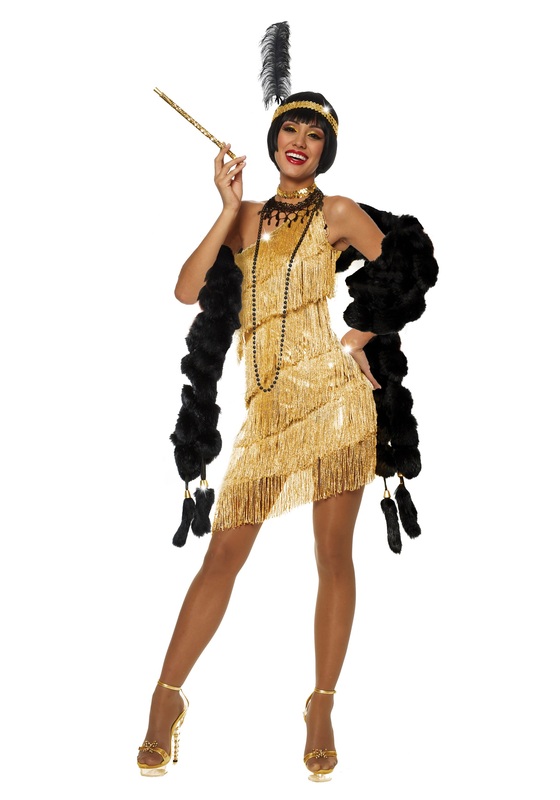 So if your ready to shine like a star, grab this Dazzling Gold Flapper costume for women and let the good times roll!